Russia's economic development minister has conceded that the country has entered a downturn, with the Ukrainian crisis and capital flight having a serious effect on growth. The Ministry of Economic Development has acknowledged that the Russian economy has entered a recession after the economy shrank by 0.5 percent in the first quarter of 2014. At the same time, the Ministry is not yet able to calculate the impact of sanctions on the country’s economy. 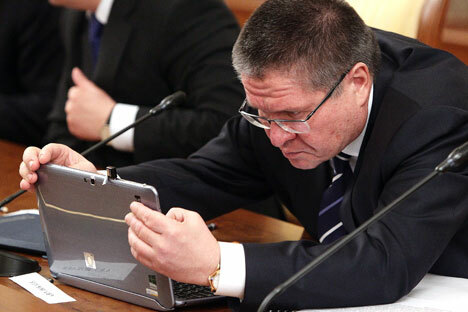 Economic Development Minister Alexei Ulyukayev said that his agency does not exclude the possibility of a technical recession in the economy in the first half of this year. This will happen if GDP growth in the second quarter turns out to be negative. Ulyukayev added that the ministry had not calculated the impact of U.S. and EU sanctions on Russia’s economy. “I think this is impossible to calculate, in principle. This is because there were no formal economic sanctions, and there is an expectation of sanctions, which, from my point of view, is even more dangerous for the economy, because it means that there will be a pause in investments, when no investment decisions will be made, and in some cases already taken decisions are being wound up,” he said. The forecast prepared by the ministry says that in the short and medium term, Russia has enough reserves to compensate for most of the losses caused by the sanctions, which in the long term may also undermine the state budget and reduce opportunities for modernization, due to restrictions on the import of technology, investments and best practices. A continuation of the Ukrainian crisis could lead to a worsening of borrowing conditions, a growth in risk premium and increased capital outflows, causing a weakening of the ruble, rising inflation and a reduction in consumer confidence. Ulyukayev admitted that the expectation of sanctions has already affected the investment climate in Russia. “Of course, the big role of this factor can be found in the fact that for the first quarter we have seen a negative trend in investments into fixed assets (minus 2.4 percent),” he said. The probability of a recession in the Russian economy in the first half has not been ruled out by the Ministry of Finance, which in early May predicted a decrease in GDP in two consecutive quarters. Earlier, in late April, experts from the International Monetary Fund (IMF) concluded that Russia’s economy has entered a recession. In a statement, the IMF noted that the fund had lowered its GDP growth forecast for the country in 2014 to 0.2 percent, down from 1.3 percent in the previous forecast, which was made in early April. At that time, a poll of analysts conducted by the Bloomberg Agency showed that the probability of recession in Russia within the next year was a record 50 percent. The strength of this prediction was due to the threat of new sanctions being imposed against the Russian Federation in connection with the escalation of the conflict in Ukraine. Previously, the main reasons for the downturn in the Russian economy were capital outflows, which will remain quite intense, as well as the weakening of the ruble and a resulting decline in consumer activity. Based on material published by Newsru.com and Kommersant.